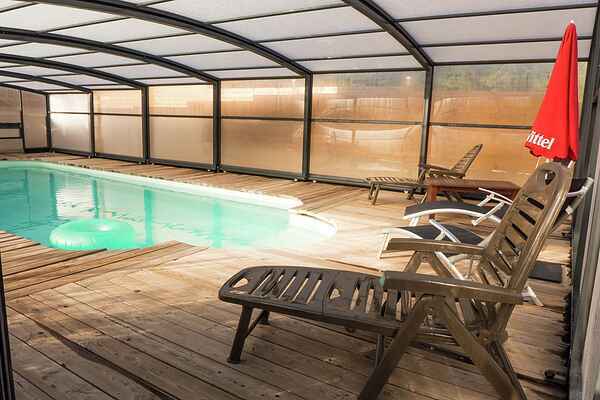 Very comfortable semi-detached holiday home with stylish, warm interior decor and a private enclosed swimming pool. The holiday home has been completely renovated and authentic style elements are interspersed with a colourful and tasteful decoration. The serene village of Fraissé-des-Corbières is located in the heart of the beautiful hilly wine region of the Corbières, at just 20 km from the wide sandy beaches of the Mediterranean Sea. Several hiking trails are accessible in the immediate vicinity and even straight from the village. To enjoy your day at the beach you can take a short drive to Port-la-Nouvelle (22 km). A alluring little fishing harbour on the coast of the Mediterranean Sea. A tennis court, a bakery and daily shopping in St. Jean-de-Barrou (2 km). Restaurants in Durban-Corbières (6 km). Large shopping centre in Sigean (15 km). Visit the castle of Salses (26 km), a cross between a medieval castle and a military fort where Spain and France alternately held power. Go visit the prehistoric museum in Tautavel (31 km) and enjoy the silence of the Abbeys of Lagrasse (40 km) and Fontfroide (45 km). You will definitely thrill the children with a visit to the Sigean safari park (15 km).